Freesat has announced strong quarterly results with the addition of 24,000 new homes in the three months to the end of December 2014. After adding 56,000 homes over the course of the year, Freesat says it now reaches 1.9 million households and is watched by more than four million viewers every week. The free-to-air satellite service, which is backed by the BBC and ITV said today that sales benefited "from a fall in the price of Freesat products while competitors pushed through price rises for their monthly subscriptions." Meanwhile Freetime, Freesat’s connected television service, continues to grow and accounted for almost 50% of all Freesat set-top box sales in the last quarter. Freetime allows viewers to roll back the TV guide to watch shows from the past seven days, pause, record and rewind live programmes, and access all the major Catch Up players. Demand for the Freesat mobile app, launched in January 2014, was strong, with total downloads approaching 500,000. The recent launch of the Kindle Fire version of the app in December also helped to attract new audiences to Freesat. 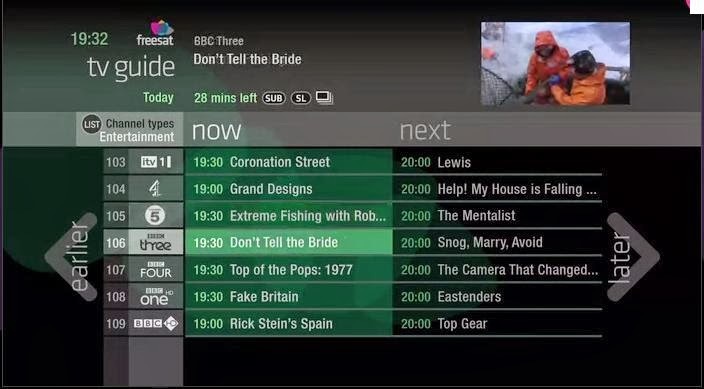 Find out which channels are on Freesat and where you can find them.